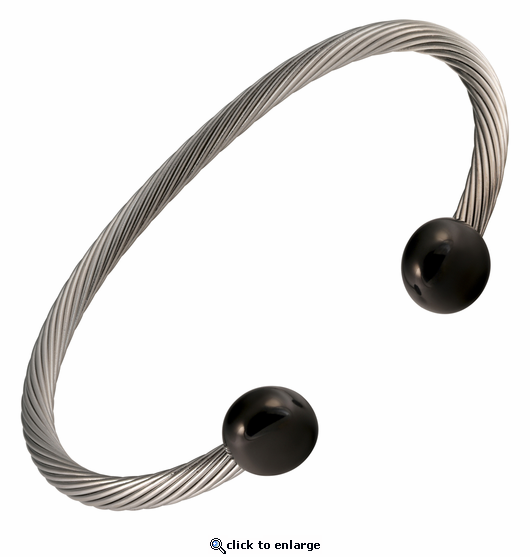 This is a two tone cable wire stainless steel magnetic therapy bracelet. It is completely made of stainless steel. The 2 - 3000 gauss neodymium rare earth bio north facing magnets are in the black plated solid stainless steel M&M shaped ends. This fine quality nickel free magnetic bracelet is made with stainless steel twisted wire. I got this bracelet for my husband for our anniversary. He has a really large arm so I was a little worried it wouldnt fit well but it fits wonderfully. He loves it!